What's the species of 'Shahtoot'? 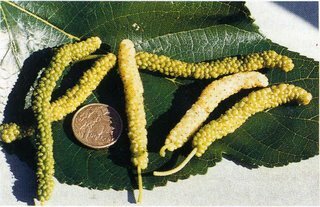 Morus alba? I used to know the differences, but I've long since forgotten. Spot on it is Morus alba. North side of the house: if Shahtoot is planted on the north side of the house then in winter, when the leaves have fallen off, the sun will brighten up the area and let in warmer northerly winds etc. South side of the house: if planted on the south side of the house then in winter the cold southerly winds will make the house colder as the winds blow through the leafless shahtoot. Daleysfruit does not sell Morus alba and just as well too because it is strange tasting most of the time.Morus macroura is the correct botanical name for the Shahtoot. Would this tree be good to espalier? Also does is grow in shade/semi shade or does it need full sun? I have one in my back yard but the birds usually get to them before we do. Any suggestions . I recently planted a shahtoot (2-3 months ago), the leaves are turning black around the edges and something is eating them as well. Is the black normal for this time of year? a defficiency? a disease? And what would be eating the leaves? I cant find any info to tell me. Any ideas greatly appreciated! Thanks for providing info on these hybrid tree species. 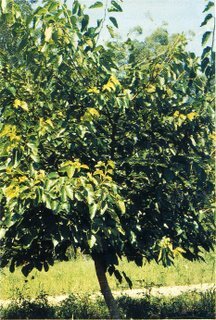 Knowing when to prune a shutoff tree would maximize branching. This would seem to simplify its maintenance in the long run. I have an apricot shahtoot planted almost 3 years ago at 1 metre high. It grew very fast and I have topped it at just over 2.5 metres to keep it manageable. It has loads of growth, looks vigorous and healthy but doesn't fruit yet. What age should it start fruiting? I haven't fed it for over a year, it gets extra watering in the middle of summer but not a great deal and doesn't look like it lacks anything but still no flowers. Can anyone shed any light on this for me as to when it should fruit and anything it specifically needs? We are sub-tropical Bay Of Plenty, New Zealand. North side of house, fairly sheltered but open aspect, a few frosts in winter.